Greetings again from the darkness. Welcome to the island of misfit High School geeks. Co-directors Cristina Constantini and Darren Foster introduce us to a few of the kids from around the globe who are striving to compete in the Intel International Science and Engineering Fair. More than 1500 students from dozens of countries qualify each year to present their ideas for a $75,000 grand prize. There are many rules, but the key is that the project must have “global impact”. Does this sound more important than a football game? Well, not in South Dakota! The film opens with the viral clip of a previous winner who literally ran onstage screaming and crying when his name was announced as a winner. We then meet Jack Andraka today, and in his interview, he explains his guttural response and the impact of the fair both for individuals and idea advancement. Jack, now in his 20’s, works as a researcher. We follow 9 students from various parts of the world – each with different backgrounds, interests, expertise, and motivations. The support they receive from parents, teachers and schools also varies, as do the resources available. Students being followed are from a Kentucky, South Dakota, Brazil, West Virginia, Germany and New York state. The systems range from a magnet school to a public school without a science lab. In South Dakota, a Muslim girl named Kashfia bluntly states that athletics are the focus of her school (their football team went 0-9), and her science teachers had no interest in being her faculty sponsor … so the football coach agreed to fill the role. This is contrasted to a New York teacher who commits her off-hours to mentor and push students to participate and compete, and she regularly sends multiple students to the fair. In West Virginia, a frustrated math teacher discusses how one student had no interest in homework or tests, then we hear the student explain his advancements in artificial intelligence. A German student diligently works on improving the aeronautics on single wing aircraft. Other projects include detecting arsenic in water, the effects of drug and alcohol abuse, and preventing cancer rather than curing it. It’s an impressive lot. Quite a few of the students hail from immigrant families, and each student is inspiring, intelligent and ambitious. Given the political climate in the U.S. these days, it is heart-warming to see so many youngsters who want to make the world a better place. The directors also interview past winners, but are not allowed in the exhibit hall once the judging begins. National Geographic has sponsored this documentary which won the Audience award at both Sundance and SXSW. These students are the ones that give us hope for the future, and remind us that sports are a nice pastime, but it is intelligence and technical advancements that will sustain the species. 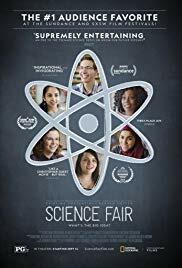 The film should be used to recruit more students into working towards the Olympics of Science Fairs! This entry was posted on Sunday, December 23rd, 2018 at 5:12 pm and is filed under Documentary. You can follow any responses to this entry through the RSS 2.0 feed. You can leave a response, or trackback from your own site.